New 9 hole golf development course. New bunkering at 10th hole. Swanston Golf Course has been completely transformed by replacing 6 of the original holes on the steeper slopes of the Pentlands with 6 new holes on the lower level. Holes 6 and 12 have also been newly developed out of the existing course land and with some new bunkering and new tees at other holes the course has been upgraded substantially. In 2005 Graeme Tait and I started discussions with Colin McClung, the owner of Swanston Golf Club. His vision was for a family friendly course with options for all members of the family to be involved. Swanston at the time was struggling for members and the clubhouse was in a state of disrepair. To create Colin's vision we had to consider how we could replace the less golfer friendly holes on the steeper slopes of the Pentland Hills with more playable holes that would combine with other good holes on the course to create a course that would draw in new members. In addition we planned for a 9-hole short course and a driving range. The 3 year development saw the construction of 6 new holes on new land to the east of the course, a short course and driving range to the south and re-modelled holes 6 and 12 on the old course with a re-routing of holes to create the new layout. We also created new short game facilities and a putting green. There were many challenges to this project, not least the main gas pipe that feeds the Borders area, some steep slopes and poor drainage in areas, overhead main-line cabling and pylons and a relatively small area to work with. However we overcame these and create a well integrated and friendly set of new holes which blend well with the surrounding landscape. The results were received very well and membership is now thriving. The new clubhouse sees many visitors daily and members are now enjoying a more user friendly course with a variety of challenges and excellent features. the main image above shows the view across the new holes from the south. The short course is in the distance. 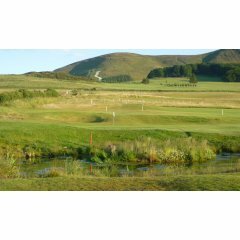 The image below is taken from the north side and shows the short course in the foreground with the Pentland Hills in the distance.